Samsung Galaxy Note9 is going to unveiling on August 9 and the leaks are on the hype. Samsung has accidentally announced its Introductory video today and now Its retail box has shown us all it key specs and features. It confirms us a 4000 mAh battery and Remote control feature of S-Pen. After today's leaked intro video of the Galaxy Note9, it's the time for some real numbers and a detailed specs. 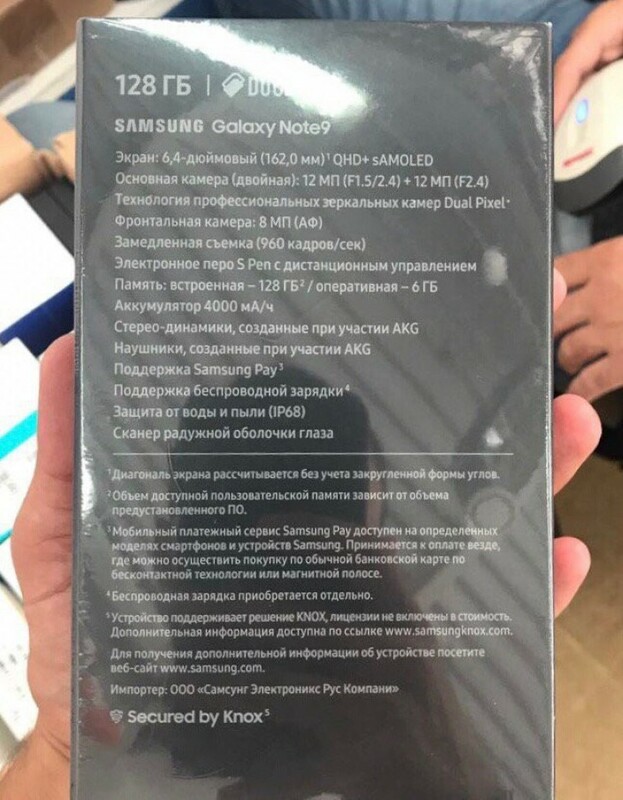 The Picture came from an official retail box for the Russian market. It holds almost everything we would want to know about the Note9's exciting new features. The Note9 boasts a 6.4-inch QHD+ Super AMOLED display confirming what was previously speculated but more importantly, the specs sheet mentions Galaxy S9+'s dual camera setup on the back - 12MP main lens with adjustable aperture (f/1.5-2.4), Dual Pixel PDAF support and a secondary telephoto one with 12MP resolution and f/2.4 aperture. The front camera is 8MP with autofocus. As expected, the duo of cameras on the handset's back will be able to record super slow-motion videos in 960fps for twice as long as the Galaxy S9 and S9+. The list on the back of the retail box continues with S Pen's remote control feature, 128GB of internal storage paired with 6GB of RAM and an upgraded 4,000 mAh battery. Additionally, the device boasts stereo speakers and earbuds, both designed by AKG (or in collaboration with AKG). For protection against water, the Note9 has IP68 certification and for biometric security, it uses the already known iris scanner and fingerprint reader on the back.